Parts of your life are missing. Maybe you’ve forgotten, purposefully or by accident. You were overwhelmed and didn’t look, too influenced by love, anger, or adult beverages to take full notice. 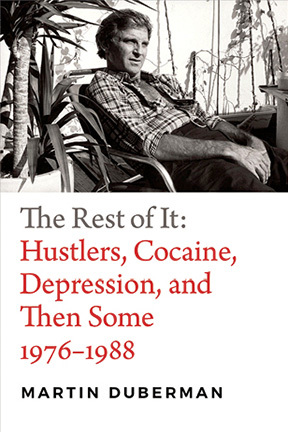 Sometimes, you wonder what’s missing but in the new book, The Rest of It: Hustlers, Cocaine, Depression, and Then Some 1976-1988 by Martin Duberman, one man’s gaps are filled. They began with his mother’s illness in late 1976, and her surgery for cancer that was initially said to be non-cancerous, but that was finally diagnosed as malignant melanoma. Duberman had had a complicated relationship with his mother and they’d made their peace; still, hers was a horrible death and it plunged him into his work, and a bout with depression. Still, he continued to write. It was a time “of a flowering of gay culture” when many gay literary giants were publishing—and that included Duberman himself. It was a time when bath houses dotted New York City, AIDS was emerging as a crisis, and Duberman was celibate and addicted. It was a time when he had nearly hit bottom before he found help and love. You may be thinking that The Rest of It is on the self-contemplative side—and you’re right, though it could also be argued that many memoirs are such. No matter; what keeps you reading isn’t the biography that author Martin Duberman offers here. Duberman’s life was keenly interesting in the dozen years between 1976 and 1988, but so were then-current events, which he carefully recounts. This book shows an emergence of gay culture on a larger scale, growing activism, and the dawn of AIDS; his voice is occasionally snarky as he takes on the medical establishment of the times, gay nightclubs and bath houses, and Reagan politics. In these ways, his deeply-personal memories, mixed with what happened when, are vastly more appealing than if this book were mere memoir.